Volkswagen's improving results in the US have been bolstered by its expanded sport-utility line-up, but the maker is also providing its loyal Passat owners something new for 2018: the Passat GT. 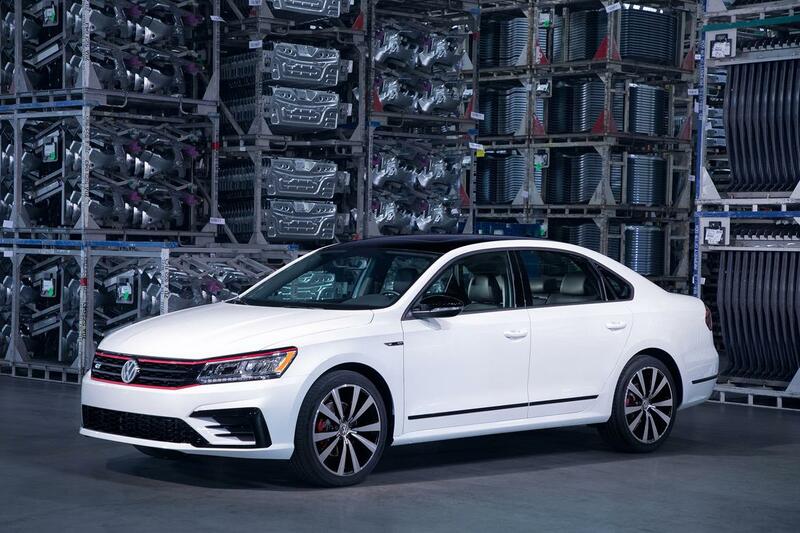 This new version of the Passat draws inspiration from the popular VW GTI and shows it with numerous sporty styling cues, not the least of which is the red grille trim. Until now with the Passat, you had to choose either show or go. Available in the second quarter of 2018, the VW Passat GT sounds too good to be true for under $30,000. The Passat R-Line starts at $25,845 and the loaded V-6 SEL Premium starts at $35,500. Volkswagen introduced the hopped-up Passat GT Friday before the Detroit auto show. The rear has a black spoiler and tinted LED taillamps, together with black trim on the bumper and a double exhaust with VW's acoustic package. Starting at the front, Passat GT differentiates itself from standard Passat models with standard LED headlights and LED Daytime Running Lights (DRLs). Two-tone 19-inch "Tornado" wheels are accentuated with red-painted brake calipers, another nod to Volkswagen's performance heritage. The roof is black regardless of whether the body color is Pure White, Reflex Silver, Platinum Grey, or Deep Black. The GT's interior has piano-black center-console and vent trim, carbon-fiber accents, a black headliner, aluminum GT-badged door sills and a leather-wrapped steering wheel. Seats are made from black leatherette with Moonrock Gray inserts and contrast stitching. And the sedan features two USB ports - one in front and one in the rear. In the Passat GT, the V-6 is rated at 280 horsepower and 258 pound-feet of torque and it sends power to the front wheels. The engine is mated to a standard six-speed DSG automatic transmission with Tiptronic, which features steering wheel-mounted paddle shifters. The GT also gets a sportier suspension that's been tweaked slightly lower. To keep passengers connected, the Passat GT features a Composition Media infotainment unit with 6.3-inch capacitive touchscreen display and standard Bluetooth® for compatible devices, Voice Control, and Volkswagen Car-Net® App-Connect technology that offers compatible smartphone integration with the three major platforms-Apple CarPlay™, Android Auto™ and MirrorLink®. In line with Cars.com's long-standing ethics policy, editors and reviewers don't accept gifts or free trips from automakers.